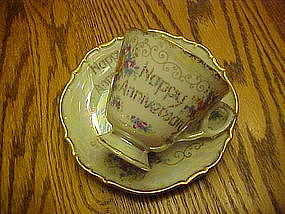 A wonderful vintage china cup and saucer to celebrate any anniversary. Made by Norleans fine china. It has a thick lustre finish that looks like mother of pearl. Delicate sprays of roses and violets and oodles of gold trims. Gold is bright and shiny. "Happy Anniversary" spelled out in tiny flowers. Original label and is in pristine condition!